The Mini Convertible just purred with delight as I pressed the toggle switch above the mirror and within 18 seconds the fabric roof had folded back and the sun began to burn the through the very few white hairs on the top of my head. And you don't need to do it while parked, the roof will open or close at speeds of up to 30kmh. It had to be done on Monday and Tuesday as often as I could, as it was the last convertible test drive of the summer and, as we saw here in Dublin on Wednesday, it wasn't going to last. But that was ok, the car was returned by then and my ego and fond memories had been massaged as well as the sun cream into my scalp. I had a girlfriend once whose great exhibitionist tendencies completely revved up when I was driving convertibles; as one top came down another came off, with bra and T-shirt thrown in the back. Pleasurable as it might have been, my main thought was of being locked up for offending the morals of any observant villagers. This comely young lady was a generation after my first girlfriend who drove her Mini like a rally-driver while wearing the shortest skirt that the late Sixties could fashion. I'm a different beast now but the memories made my week in the latest Mini Convertible all the better. Of course, it is a car that would be totally impractical for us. Despite being bigger than its predecessors, it's far too tight in the front, the back seats are even more cramped, the boot space is compromised and on top of that you could be shelling out €11,000 above the list price of €26,800 for the Mini Cooper Convertible by the time you add in things like the lovely Caribbean Aqua Metallic paint, Satellite Grey/Carbon Black leathers, navigation system, Chili pack with all sorts of extras included, front seat heating, wind deflectors, etc. The test car was powered by a three-cylinder petrol engine with a TwinPower Turbo and will do 208kmh with 0-100 in 8.8 seconds. There's also a whole range of other options, some more powerful, others less so. But I felt this one was about right. The six-speed box has incredibly long ranges across all gears so you must keep a firm look at the revs to judge your changes. The Steptronic automatic would be even more excellent. Yet, as I was remarking to a friend, if you had the money there would be no better second car for those days when you really want to have a blast and cheer yourself up. 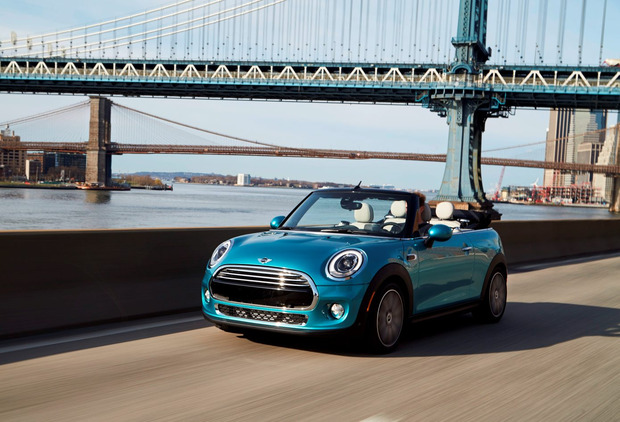 This third generation of the Mini Cooper Convertible has much improved suspension and stiff body structure to emphasise the great go-kart handling that can be tweaked using the optional driving modes control. It is very posh inside and out with a totally solid premium feel about everything, from the funky lighting on the fascia to the very solid boot lid which falls flat to give much-needed extra carrying capacity. My only complaint is that there is a bit too much fussiness which crowds the cabin even more than it needs to. My main passenger last week was Sam, as I shuttled our dog to and from the vet for heart scans. Lifting a solid lab/collie cross in to the back seat wasn't at all easy. But he enjoyed the top down too and knew that when we drove through Phoenix Park that we were nearly home. I worry for the economy if they sell a lot of Mini Convertibles at nearly €40k but it was a great drive and it was my summer treat. The brilliant handling, memories of breasts and legs, the sun and wind in my hair could almost make it worthwhile. Almost, but not quite.